Motivate and inspire your friends and family to successfully face the challenges of the New Year. Inspirational New Year wishes to have all the success and goals a year can bring in your life. ♦ As a new year dawns, may each ray of sunlight be a warm reminder of the many happy moments that lie ahead. ♦ In 20.., may you meet unique people, enjoy fresh opportunities, and find inspiration in each new day. ♦ May you take the untrodden path, and may your load be light as you step into a new year. ♦ I pray that you will scale every summit, trek every trail, and enjoy every journey as you move into an adventuresome new year. ♦ Here’s hoping that you reach the pinnacle of your passion in 20… Happy creative New Year! ♦ In the new year, may you forgo every fear, find your fire, and free yourself from all restraints. ♦ May your aspirations for the new year take you to new altitudes. Happy New Year! ♦ As the new year makes its debut, may the feature be creativity love and laughter. ♦ May you witness wisdom and warmth in the coming year. May a huge success find you in the New Year! ♦ Prayers for courage and conviction, hope and happiness in the new year. ♦ May the new year bestow blessings and bliss upon you and yours. ♦ May the New Year be a successful one for you. ♦ May your new year be a fragrant garden filled with beautiful blooms and bountiful bouquets. ♦ Wishing you grace, gratitude, and growth in the coming year. Happy creative New Year! ♦ Prayers for you to transcend every trial and have a triumphant new year. ♦ Here’s hoping that the New Year has a heart of gold, and that it glitters for you. ♦ As the new year unfolds, may you find the freedom to explore captivating frontiers. ♦ May The New Year be all about winning and happiness. ♦ I’m looking forward to a new year filled with time spent with you and fulfill our dreams. Happy New Year! ♦ As we anticipate another year, may we remember to persevere with patience and passion. ♦ As a new year stretches out before us, may we expect to live each day with purpose and peace. ♦ May your new year be witty, gritty, and pretty. Happy creative New Year! ♦ May your troubles be trifling and your blessings be blissful in the coming year. ♦ Lifting you up in prayer as the possibilities of a new year await. May you choose the right path always. ♦ I’m wrapping my arms around you in spirit and sending heartfelt hugs as you prepare for the coming year. May it be all you hope it will be. ♦ Wishes for good, old-fashioned fun, friendship and success in the new year! 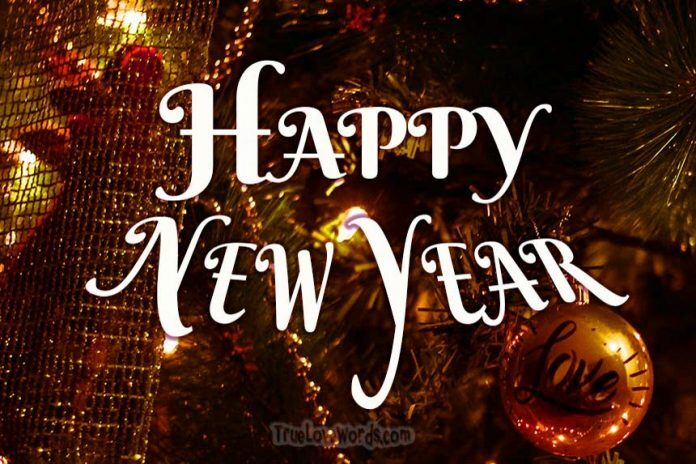 ♦ Wishing you generous helpings of health, happiness, and hugs for the coming year. ♦ On the brink of a new year, may we drink to happiness and love. ♦ Good luck as you enter another year. May you accumulate many blessings on this trip around the sun. ♦ Let’s keep in touch and share many successes in the new year. ♦ The future is beaming with the light of love that awaits. Happy successful New Year! ♦ Imagine all the possibilities as you enter a new year. Here’s hoping that all your dreams come true. ♦ Full speed ahead into a new year of fresh opportunities and second chances. ♦ Hurdles are hard and walls can leave us weary, but I’m praying for you to be strong and persistent in the coming year so that you can overcome every obstacle. ♦ Face the changes, confront the obstacles, and take the risks. You are strong. You are able. You are an amazing person. ♦ Don’t look back, and keep your eyes on the prize. 20.. is going to be a great year. ♦ All the best as you dream, scheme, and pick up steam. ♦ No doubts, no disbelief, no lack of determination will be allowed in 20… Pursue every dream. ♦ Be brave and fight for a better future. Happy successful New Year! ♦ No stressing, no messing, no time for guessing; the new year will be all about blessing. ♦ Take control and let it roll! May the New Year explode your creativity! ♦ Experiment with life. Focus on a winning formula, and you will find success. ♦ A willing heart and a brand new start are all you need to succeed. ♦ The darkness of the past can be extinguished with a single point of light. May you keep the flame alive as you step into a new year. ♦ It’s never too late to change the future. May the New Year brings you new ideas and new challenges! ♦ The future has no speed limit. Step on the gas and get your chances. Happy New Year! ♦ The key to the future is in your heart. May you unlock all the possibilities that the New Year holds. ♦ May the New Year be a jaw-dropping year, exploding with blessings. ♦ Loads of luck and bundles of blessings as you enter a new year. ♦ Soak in the blessings of a new year. ♦ May your abilities be strong, and your endurance be long in the new year. ♦ Here’s wishing you a sparkling new year filled with precious gems waiting to be mined. ♦ May 20.. be a high-scoring game filled with fanfare and style. ♦ In 20.., may you lose the boos and claim the game. I’ll be cheering for you. ♦ May intricate blessings beautify your new year. ♦ In the new year, may blessings whirl about you like snowflakes. ♦ May you hit the ground running as you leap out of the old and into the new. ♦ Bon voyage as you set sail into a new year. ♦ As you journey into a new year, here’s hoping that your destination is delightful and you don’t lose your luggage. ♦ May the quests of 20.. be high in quality and quantity. ♦ Here’s hoping that the New Year transports you into a world of possibility and wonder. ♦ As you sail into the future, may the trip be scenic and satisfying. ♦ As we ride off into the sunset of 20.., may we round up the best of everything to bring into the New Year. 65 Sweet New Year Wishes For Lover – Happy New Year Baby!